English indie band The Enemy is hoping to make a name for itself once again with the May 21 release of its third studio album, “Streets in the Sky.” Following a two-year break after the relative disappointment of its sophomore album, the band aims to return to the success of its first release, “We’ll Live and Die in These Towns,” which went platinum in the U.K. in 2007. 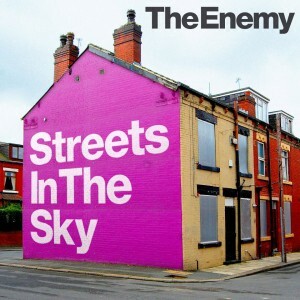 After a disappointing sophomore album, The Enemy took two years off before coming back together for "Streets in the Sky." The new album was released May 21, and features more party music than their previous albums. Musically, it does feel as if The Enemy has made a U-turn with this latest offering. Despite the lead single “Saturday” talking about a “frosty milkman in the morning,” the band split recording time between London and the rather warmer Los Angeles, a long way from the band’s founding base of Coventry, England. They have brought in Joby Ford from LA punk rock group The Bronx as a new album producer, and the band plans to put a larger foot in the U.S. market with its upcoming tour later this year. Overall, The Enemy is continuing with its familiar sound. For those who are into fast-paced, energetic rock with catchy choruses, this is an album for you. “Gimme a Sign” is a good opener that gets the album going, and “It’s a Race” and “Make a Man” almost sound like they could have come from the late-70s punk era. The band members themselves admit that now-dispersed groups such as Oasis, The Jam and The Clash were a huge influence on their sound and lyrical content. The band pours energy into songs that speak about social situations and society as a whole. However, they tend to be simple, lacking depth. Familiar references to life in drab inner-city areas are present, although sugarcoated this time — something hinted at by the fluorescent pink coloring of the album cover. The 13 songs on the album were apparently whittled down from an initial 30, and a few of them still suffer from sounding repetitive — the constant thrashing of guitars could give you a slight headache after a few tracks. The second half of the album is a little more varied than the first. “Streets in the Sky” ends curiously with an acoustic version of “Turn It On” in which Tom Clarke’s loud, rousing vocals do little more than drown out the instruments. “Streets in the Sky” sounds better the second time around, but by then you will probably know whether you have taken to it or whether it will become just background ambience at a noisy party. This is definitely an album to dance to. There is no doubt that The Enemy will be a popular act at the music festivals this summer. If you are new to the band, you will find “Streets in the Sky” a good summary of its style. More established fans, however, may be left scratching their heads wondering if they’ve heard it all before.